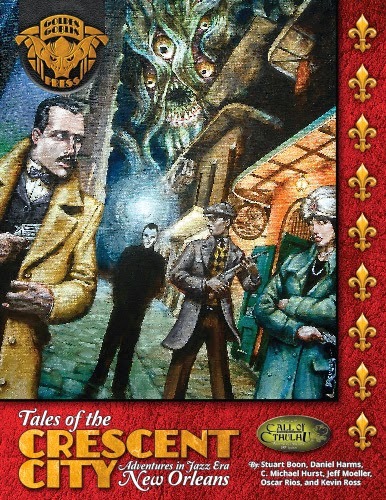 Tales of the Crescent City: Adventures in Jazz Era New Orleans is the second offering from Golden Goblin Press for Call of Cthulhu, following on from Island of Ignorance – The Third Cthulhu Companion. Again funded via Kickstarter, Tales of the Crescent City is a companion volume to Chasoium, Inc.’s Secrets of New Orleans: A 1920s Sourcebook to the Crescent City and a sequel of sorts to Miskatonic River Press’ anthology of scenarios set in New York, Tales of the Sleepless City. It presents an introduction to, and an overview of, the city of New Orleans; an examination of both a major figure in the Mythos and a major Mythos influence upon the city; and a septet of scenarios, including a revised reprint of a classic adventure. The latter, like the rest of the scenarios in the collection are written for use with Call of Cthulhu, Sixth Edition, though as with all Call of Cthulhu scenarios, they are compatible with the forthcoming Call of Cthulhu, Seventh Edition. The first good news about Tales of the Crescent City is that it is a better book than Island of Ignorance. It is physically neater and better designed, the editing is clean and tidy, and of course, the subject matter and setting give the anthology focus. It feels closely modelled upon the aforementioned Tales of the Sleepless City and as a result, is an assured product that bodes well for future releases from Golden Goblin Press. Although the Keeper and his players will get the most out of Tales of the Crescent City if they have access to copy of Chaosium’s Secrets of New Orleans—previously printed as The New Orleans Guidebook, it is not absolutely necessary for either to own a copy of that supplement. Included in this new anthology is an introduction to the Big Easy, one that nicely sums up the key points that everyone needs to know—the matter of race and colour, the rampant corruption, the endemic presence of crime and gangsters, the importance of civility and thus the Credit Rating skill, and the fact that the city is below sea level. This is accompanied by a thorough overview of the city’s various neighbourhoods and parishes, including floor plans for its typical dwellings. Illustrated throughout with period photographs, there is enough information here that a Keeper need not refer to Secrets of New Orleans when running Tales of the Crescent City. Readers familiar with H.P. Lovecraft’s fiction will know that New Orleans is home to Étienne-Laurent de Marigny, America’s most knowledgeable mystic, mathematician, and orientalist. It is fitting that he is accorded a lengthy article all to himself, providing an autobiography of the man as well as hinting at what he knows about the Mythos—which is actually quite a lot given that he is not actually insane. There is the danger in having a figure such as de Marigny present in a campaign—and that is what Tales of the Crescent City is really intended to be part of—in that he becomes a crutch the players and their investigators come to rely upon when their investigations fail. Offsetting that possibility is one of the key points raised earlier in the book, that of the need for civility and thus the Credit Rating skill in their dealings with de Marigny. As fascinated as he is with the outré and the occult, he has no desire to be involved in scandal or criminal activities, both of which the investigators are likely to find themselves involved in. Rounding out this short series of articles are some notes on the Yellow Sign and The King in Yellow, yet more support for the scenarios that follow in Tales of the Crescent City. The support is certainly required in the case of said notes on the Yellow Sign, since the septet of scenarios is bookended by appearances of the Yellow Sign and The King in Yellow. The first of these is a reprint and update of Kevin Ross’ classic ‘Tell me, have You Seen the Yellow Sign?’ originally published in Chaosium’s long out of print The Great Old Ones. Like many scenarios that deal with the Yellow Sign and The King in Yellow, at the heart of ‘Have You Seen the Yellow Sign?’ is an attempt to bring to Earth both Hastur and the city of Carcosa; thus it feels like a cliché. Yet that is unfair, as arguably, ‘Tell me, have You Seen the Yellow Sign?’ set the pattern for such scenarios to come and what matters is the story built around the cultists’ plans to bring Hastur to Earth. In this case, ‘Tell me, have You Seen the Yellow Sign?’ draws the investigators into a richly portrayal of New Orleans life and culture, in particular, that of Mardi Gras. This is carnival season, a big celebration, in which it is socially acceptable to join ‘Krewes’ and participate in big masked parades. The investigators find themselves asked by Étienne-Laurent de Marigny to investigate an occult symbol found clutched in the hand of a recently deceased reporter. The police think it was suicide, but his editor thinks otherwise, especially after the reporter told him that he believed that one of the krewes he was writing about was involved in the occult. De Marigny does not have the time to investigate, which is where the player characters come in. Experienced Call of Cthulhu players will recognise the symbol, but they will enjoy both the investigation into the reporter’s death and into identifying the symbol. Both will take the investigators to the heights of the city’s high society and deep into the sodden wilderness. As the investigators draw ever closer to identifying the symbol, the symbol seems to draw closer to them and the city… This is a richly detailed scenario, with lots of investigation and atmosphere with a pleasingly personal element to the story. As the title of C. Michael Hurst’s ‘Bloodlines’ suggests, this is a scenario about questionable parentage and the degeneration of the species, classic Lovecratian themes both. The investigators are hired by a researcher to confirm the lineage and wealth of his employer’s fiancée—what the researcher has learned threatens what is his only source of income. By the time they go to meet him, the researcher is dead and his mother begs them to continue the task lest she be made destitute. How did the researcher come to die and did it have anything to do with the family history of Cora DeCroix? Once again, this takes the investigators from the heights of society to swamps beyond the city, though the society is somewhat dissolute… In comparison with the previous scenario, ‘Bloodlines’ is a more restrained affair, the Mythos not as intentionally malign in nature, and morally, more grey than black and white. Indeed, distinguishing the villains of the piece may leave the investigators with a dilemma on their hands. That said, the Egyptian-themed Great Old One feels a little out of place in the city and almost incidental to the plot, although its use explains the supposed ‘monsters’ of the piece, plus of course, it has been used in other scenarios. By coincidence, the third scenario, ‘Needles’, also has an Egyptian theme. By Daniel Harms, it also begins with the investigators coming to the aid of someone else, though not at his request. Instead, they respond to a scream in the night to discover a local doctor in deadly peril from a trio of dark, surgically masked men. Coming to his aid, they will soon learn that the doctor is a wanted man, but by whom lies at the heart of the scenario. This is not a scenario for anyone suffering from Trypophobia, and makes an interesting use of Glaaki, even though that Great Old One does not make an appearance. The scenario very much has a pulp sensibility, which makes it quite a lot of fun especially in its ‘house of horrors’ denouement, but this also means that some of the cult’s motivation is underwritten rather than being fully developed as it should be. At its heart though is the Mythos fuelled interpretation of the ‘Night Doctors’ of both African American and New Orleans folklore, an aspect that may not necessarily come to the fore as much as it should—unless the investigators have contacts with the Black community of the Crescent City or one of their number is Black. Almost as if one theme is being carried over from one scenario to the next, there is a medical aspect to Stuart Boon’s ‘The Quickening Spiral’ in which the investigators must race against the clock to prevent a deadly contagion known as Red River Fever from overwhelming first New Orleans, then Louisiana, and beyond! The investigators are asked to look into the possibility that it might have been caused by something unnatural—could it be the result of a Voodoo curse? What is curious about this scenario is that its human plot—a heady mix of small ‘conspiracies’, Voodoo, and revenge—is very much more pulpy than the almost incidental Mythos plot. Nevertheless, this is a pacier affair the presents a potential threat to the world on a relatively small scale. Oscar Rios’ own contribution to Tales of the Crescent City is ‘Song and Dance’ and concerns the effect of the subversion and its effect by one god of another. The first is the Great Old One is Y’Golonac, who subverts not other figures of the Mythos, but figures from a real world mythology. This is a big audacious piece, assured in its aims, but one that might be seen to veer away from the Mythos in its use of real world mythology figures and perhaps in its tone as the ending feels more like that of a James Bond movie as the investigators have to stage a rescue from the villain of the piece’s lair. Set in 1925, it opens with a wave of depression that sweeps the world, driving artists and performers into depression and then suicide, but then the reverse happens—mania! This manifests at yet another of New Orleans’ great celebrations, at which the investigators are present, but it works all the better if they become more intimately involved and one of their number be an affected artist. The downside to the mania is not just debilitating, but drives its sufferers to the grave giving the scenario a desperate deadline. To be fair, there is relatively little plot to ‘Song and Dance’, but it oozes atmosphere and at times menace. The penultimate adventure in Tales of the Crescent City is Jeff Moeller’s ‘Five Lights at the Crossroads’, which is a much slighter affair then the other six in the anthology. It begins with the investigators’ discovery of the body of a well-dressed black man, seemingly crushed where he lies. If the investigators do the decent thing and go and tell his employer about his death, he is nowhere to be found and his other servants are oddly evasive. Where is he and how did his servant come to die under such odd circumstances? Unfortunately, whilst the scenario does involve a decent amount of investigative legwork to get to its climatic confrontation, at its heart it does something that may frustrate the players—keep them from their quarry until it is all but too late. Given the grave, not to say, deadly consequences of their failure, their efforts may seem out of all proportion to said consequences… Nevertheless, the scenario can be said to be about gathering the clues and information enough to get to its confrontation. It is disappointing though, and the least interesting scenario in the anthology especially given that the author has written better scenarios. This is a less heavily plotted affair than the earlier ‘Tell me, have you seen the Yellow Sign?’. It is potentially no less atmospheric, for it is expected that the Keeper build much of the minor, though no less weird or creepy, details around the investigators’ efforts. At its heart the investigators are caught up in the effort by the infamous play, The King in Yellow, to reassert its inevitability. Of course, the outcome of ‘Asylum: The Return of the Yellow Sign’ is not necessarily inevitable, but attempting to achieve any other outcome presents a difficult challenge. Overall, despite it needing careful handling upon the part of the Keeper, ‘Asylum: The Return of the Yellow Sign’ is an excellent scenario that brings Tales of the Crescent City to mature and malign climax. Physically, Tales of the Crescent City is well presented. The layout is clean and very readable, whilst the book is solidly edited. If there is a downside to the book’s look, it is that the art is perhaps a little too cartoon-like in places. Elsewhere the art is well done, as is the cartography. Undoubtedly, the material supporting the septet of scenarios in Tales of the Crescent City is excellent given the relatively few pages devoted to the setting. Unfortunately, as a whole, the scenarios are not excellent, being uneven in tone and plot, perhaps even flat in feel in the one case. The septet does have a pulp feel, especially the middle scenarios—and they also have another weakness. As much as the scenarios in Tales from the Crescent City present a broad swathe of challenges and foes to contend with and investigate, what it does not do is present much in the way of depth. It dwells too much upon high society and its mores as well as Voodoo and Mardi Gras, and so never gives the investigators the opportunity to explore a fleshed out view of the city. Nevertheless, the addition of notes in each of the scenarios to help turn the seven into a loose campaign set within the Big Easy are a very welcome addition. Uneven in places, Tales of the Crescent City does a fine job of presenting the public face of New Orleans and the insidious influences that lurk behind the joyously bravura façade. It brings back a classic scenario and gives it a much deserved sequel—could there be a sequel to make ‘Tell me, have you seen the Yellow Sign?’ and ‘Asylum: The Return of the Yellow Sign’ part of a trilogy? Perhaps in a second volume of scenarios set in New Orleans, one that delves deeper into its secrets and themes…? Tales of the Crescent City: Adventures in Jazz Era New Orleans is a solid anthology that shows Golden Goblin Press' books are getting better and better.